Did you know that you can create and manage references from within VBA code? This article gives you ideas on how to do just that. This blog is part of a complete online VBA tutorial. For the best way to learn to program in VBA, attend a Wise Owl VBA course. It is a little-known fact (well, I keep forgetting it!) 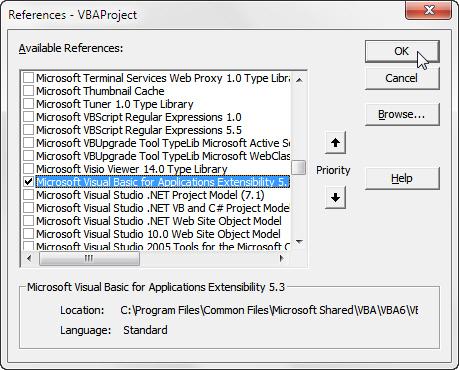 that you can create and manage your references within VBA. You need to make sure that you are comfortable with the earlier parts of this blog series on referencing other VBA applications before reading any further. To do this, select Tools -> References from the VBA code editor menu, and tick the box shown above. If you have problems running the code above, you may need to tell your application to trust the VBA project object model (Andrew has blogged in full on macro security too). Some of the properties of a reference - the most useful are listed below. MsgBox "Can not reference Word"
The code above would create a reference to the Word 2010 object library, provided that the relevant object library is in the folder given.